Earlier this year I taught a class on grains. I included a recipe for barley "risotto". Besides the fact that I happen to like this particular dish, I decided to teach it because I thought that traditional risotto (made with Arborio or Carnaroli rice) had become "old hat" to American cooks and I wanted to offer something a little bit different. But while I was teaching the barley risotto, it became apparent from some of the questions that quite a few people didn't feel comfortable or confident about cooking regular risotto. I decided after that class that I should teach a traditional risotto in my next new class. As it happened, my next new class was all about ways to use early spring ingredients....asparagus, radishes, all kinds of peas, spring onions, etc. To some, this might not seem like the ideal place to tuck in a risotto recipe. Risotto is, after all, rich...filling....creamy.... basically all the things we want in our food during the fall and winter months. Risotto is not typically associated with the words light or fresh...which are the kinds of things we tend to crave in the spring. But I love spring risottos—other than butternut squash or wild mushroom risotto, risottos that feature the tender herbs and green vegetables of early spring are typically what come to my mind when I think of risotto. The delicate flavor of the rice is a perfect backdrop for these ingredients...and the creamy texture is somehow just the thing at the end of a cool....perhaps rainy....spring day. You can alter this recipe to include all kinds of spring vegetables...alone or in combination. Cooked artichokes could be added near the end. Fresh peas...or fava beans...could be added five to ten minutes before the risotto is done. 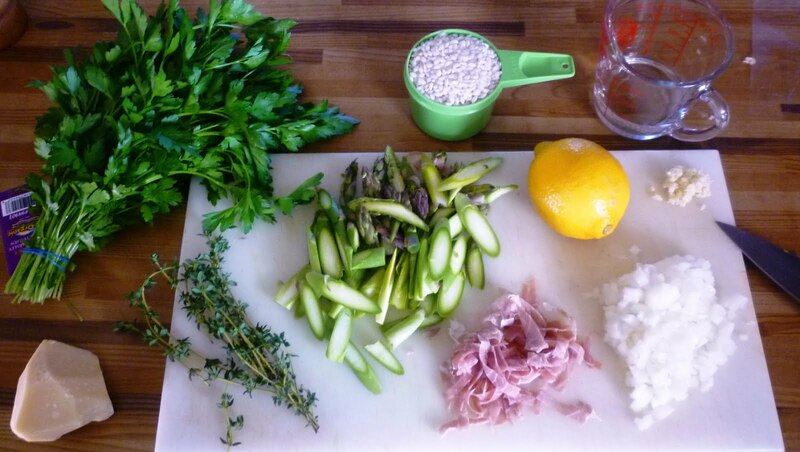 The lemon and prosciutto will compliment any of these spring vegetables nicely. Finishing the rice involves gauging the proper consistency (it should be slightly chewy, never hard in the center), enriching the risotto with butter, correcting the seasoning, and allowing the liquid to reduce until rice and sauce are unified. The goal is to bring about a marriage of rice and broth. The rice should be coated and in proportion to the sauce so that it is nearly pourable; the sauce should be reduced to the point that it doesn't separate from the rice. The challenge in cooking risotto lies in simultaneously bringing about these final refinements—a little more broth, a bit more butter, raising the heat to hasten the reduction, adding a dash of vinegar. The adjustments can be numerous or few, depending on the state of the risotto near the end. One of the things I love about his description of making risotto is that it is a beautiful rendering of what it means to truly cook: to engage your senses and interact with the food and the process in such a way that you are able to achieve your desired result. Observe.... Touch.... Taste.... Adjust. Making this asparagus risotto for your table some evening soon would be a great way to practice. Heat the butter in a heavy medium saucepan over medium heat. Add the onion and garlic and sweat until soft, but not brown—5 to 10 minutes. Add the rice and continue to cook for a minute or two—or until the rice is hot and the grains look pearly white. Add the wine and cook until the pan is nearly dry. Begin to add the stock. Add enough so that the stock is at the same level as the rice in the pan. Adjust the heat so that the rice cooks at a slow simmer. When the pan is nearly dry, add more stock and season lightly with salt & pepper. Continue to stir and cook the rice, adding more stock as each addition is absorbed. 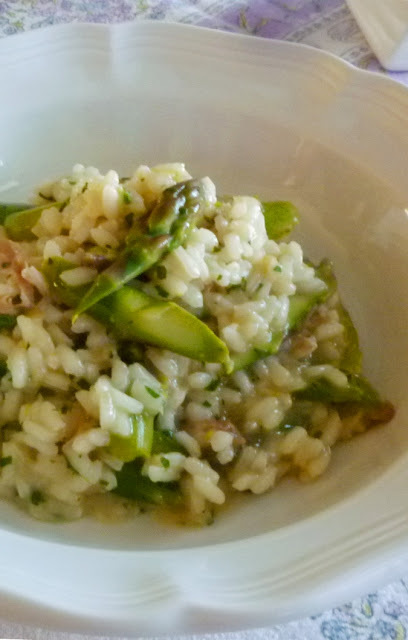 When the rice is about half cooked (after about 10 minutes of cooking), stir in the asparagus, thyme and prosciutto. Continue to cook, stir and add stock until the asparagus is tender and the rice is al dente—another 8 to 10 minutes (a total of 18 to 20 minutes from the time of the first addition of liquid). Remove from the heat and stir in the butter, cheese, parsley, and lemon zest (stirring until the risotto is very creamy). Add as much lemon juice as you would like (a small amount—1 or 2 t.—will subtly "lift" the flavor...up to 2 T. will put the acidic lemon front and center). Balance the seasoning and serve immediately. Serves 4 to 6. When you find a beautiful recipe like this and have all the ingredients in the 'house'. . you know what's for tomorrow's dinner, right? Thank you Jackie! 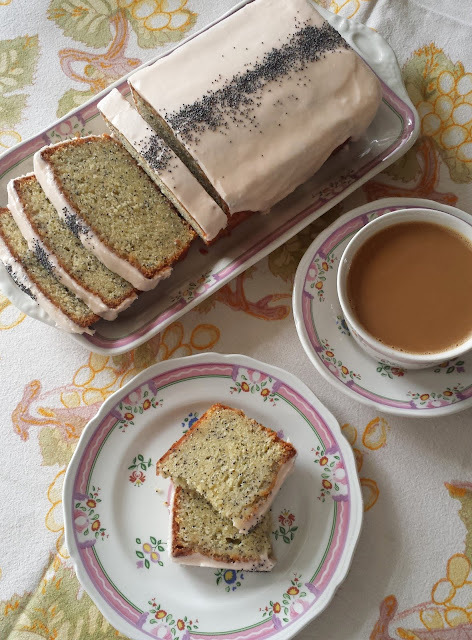 I agree...eating seasonally and keeping the pantry stocked from the farmer's market and with favorite staples means that you'll often have everything to make something that appeals to you. I hope you enjoy the risotto...it will be perfect for a cool, rainy day. Thank you Jackie! I'm so pleased to hear you had good results and that you liked it! Thank you for taking the time to let me know.